If you know someone who has always had a yen to start baking and perhaps have a go at cake decorating, then here are some Christmas gift suggestions. You never know, these might just give them the impetus to dive in and you never know, might even get to reap the rewards should a cake taster is needed! Five different colours (red, black, white, pink and blue) in handy squeezy tubes just ready for someone to get creative! 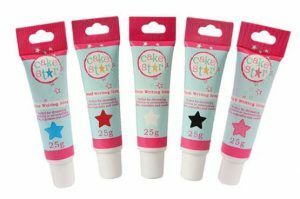 These edible writing icing tubes can be used to write messages on cakes and biscuits, add in decorative lines or create a design on a special cake. Ideal for someone who has never tried writing in icing before or the more experienced cake decorator alike. And if you make a mistake – you can always eat the evidence! This kit is great for someone who really want to experiment. 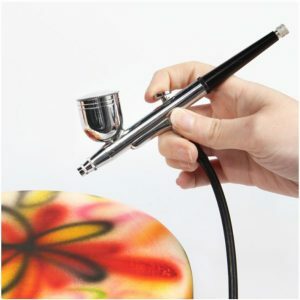 You can create professional looking finishes to celebration cakes with this Airbrush Kit. It’s easy to use so would suit both the novice as well as the experienced cake decorator. You can get seriously creative with this bit of kit. You can use it for stencilling or other fine detail work as well as for full cake coverage. A brilliant way to wow friends and family. This Master Piping Nozzle set includes 55 different piping nozzles. 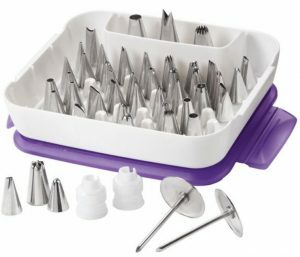 This would really inspire someone to experiment with different piping and decorating techniques with the range of tips included in this handy storage case. There are tips for pretty much any occasion you can think of – basketweave, grass, hair, petals, leaves, ruffles and more! A turntable is the starting point of being able to create beautifully and creatively iced cakes. It’s so time consuming to have to move your cake round without a turntable as you ice it and fraught with error – a turntable is an absolute must for anyone wanting to produce a great looking cake. 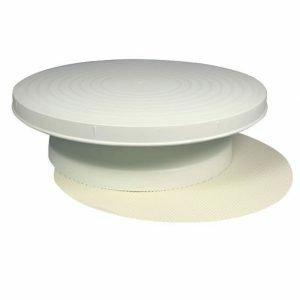 It enables the cake to stay still and with non-slip feet, this turntable won’t wander around your work surface. Different sizes are also available. 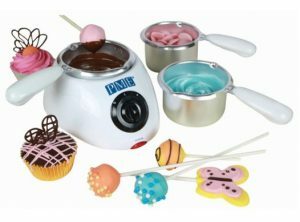 This Electric Chocolate Melting Pot comes with 3 melting pots which is a must when using more than one colour of chocolate. It is perfect for melting chocolate when needed for cake decoration or for pouring into moulds. It is also great for melting candy when making cake pops. A full instruction manual including details for making cake pops and moulded chocolates comes as part of the kit. For anyone who either makes homemade chocolates or would love to have a go, this Chocolate Mould Multipack would be a real asset. The pack includes six reusable, non-stick and easy to turn out, moulds in a variety of shapes and sizes. As well as the standard “chocolate box” type of square and domed shapes, there are also moulds for producing snowflakes, candy canes and bows – ideal for Christmas gifts!